On the road again! It felt so good to be back on the road this morning… The sun was shinning, the bike seemed to work fine and I had found a couch in Volgograd with a guy named Ivan. But before getting to his home, I wanted to make a quick stop at Bike City 34, the workshop where I had had my bike serviced the first last time I was in the city, to see if they could fit a couple of screws to my windshield and GPS support, which was still attached with two pieces of cable. There were menacing clouds ahead, but I made it to the city just after it had rained. Good, but it meant that it was now hot AND damp, not the best conditions to face the city traffic, and even less so with the streets full of puddles hiding the potholes. I met Kate again, who had read about my problems and was very happy to see me again. They had no screws in the workshop, but one of the mechanics took a scooter and went to find some somewhere else, and in the meantime, I bought a couple of summer gloves. Mine had been blown away by a sand storm in Kazakhstan and I had tried to ride from Astrakhan in my winter ones, but it was just too hot and I just rode bare-handed. The mechanic was back soon and they fitted not two, but four screws, using the extra mounting points to change the height of the windshield, so now it was rock solid. I thanked them all and went to meet my host for the night, who lived only a couple of streets away. Ivan was a really nice guy, and we hit it off immediately. I dropped my things at his apartment, had a shower and we quickly discovered that he liked climbing. I told him about vias ferratas and showed him some pictures, and he was really interested in trying it someday. He then called Sasha, a friend of his and said he would take us to see an abandoned factory near his home, another hobby we shared. It turned out to be one of this plants that heated the water for the whole city. Nowadays there are many small ones all over Volgograd, but he told me that in Soviet times they build everthing bigger, and this was supposed to be one of the biggest ones, but it was half completed when the Soviet Union dismembered and it was never finished. All that was left today was an enormous empty building and a 120-metre tall chimney. 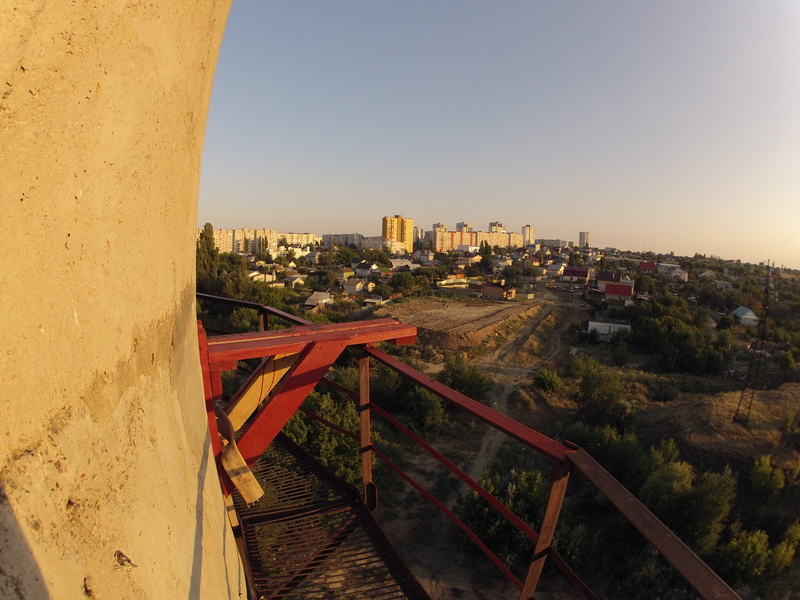 This being Russia, the place was wide open and they had only cut the first 6 meters of metal ladder in the chimney to stop people from climbing it, but someone had put a wooden one to reach the first steps, and it was easy to access. Ivan said that he had been to the top many times and that it was safe to climb, so we got on the wooden ladder and started climbing. I was only wearing shorts and flip flops, and when I got to the metal ladder I saw that it was all bent and rusty, so I had to climb carefully to avoid a nasty cut. 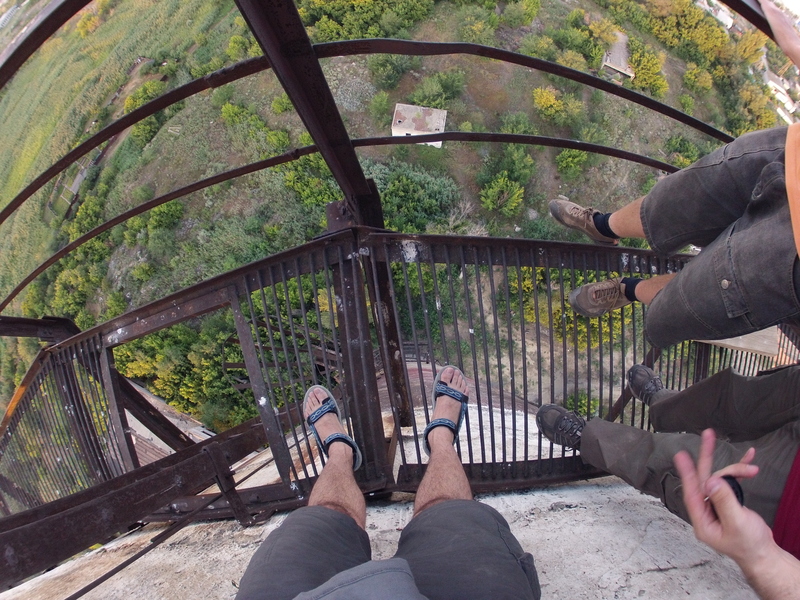 As we climbed to the first level of the chimney, the ladder moved and pieces of rust fell, so I started to wonder if it was as safe as Ivan said it was. 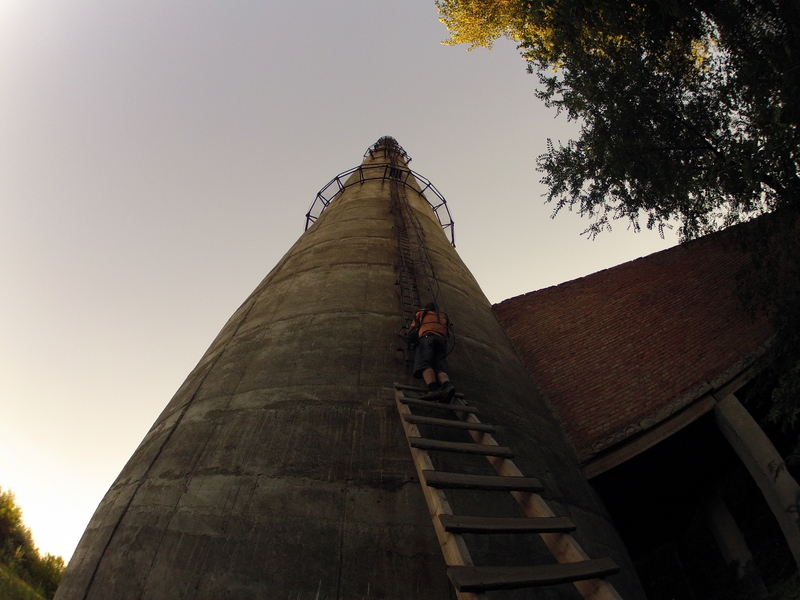 We made it to the first level, which was about 30 or 40 meters high, and had a walkway all around the chimney. We were already higher than the building around us, and someone had built a wooden structure on the walkway, on the opposite side of the ladder. Ivan told us that some people attached a rope to it and jumped from there. He convinced us to walk to the next level with a complete walkway, which was three levels up from where we were, the intermediate ones having only small balconies. I was not very sure about it, the ladder looked even worse from there on, but he said that he had done it plenty of times and there was no problem, and I thought that you do not get the chance to do something like that very often, so I decided to keep going. We stopped for a rest a the next two levels, the views getting more and more spectacular, and then proceeded to the next one. When we get there we were about 80m high, and the sun was setting. We sat down on the walkway and enjoyed the view. It was a good moment to think about the rest of my trip. I could not go back to Kazakhstan because my tourist visa only allowed me one entry, and I had lost a week waiting for the rim to be repaired. On top of that, I had been told to avoid bad roads if I did not want more trouble with the bike. I had realized that despite having changed the springs, the suspension was still too low and it did not have enough travel to handle the worst roads with the bike fully loaded, so if I wanted to go to Ulaanbaatar I would have to do it on good roads. That meant riding through Russia all the way to Irkutsk and then down to Ulaanbaatar. It was a long and possibly boring way, doing 600-800km a day to keep on schedule. When I was planning the trip, Ulaanbaator was not the final destination, it was just the point I had chosen to turn back. The real trip was all that I wanted to see and experience between my home and there, and I thought there was little point in pushing to get there just to say I had been there. Moreover, the first three weeks I had been travelling quite fast, stopping only for one night at most places, and after meeting so many great people I felt I was missing the most important thing in this trip – the trip itself and the people, that is what was important, not the final destination. I had two months to travel, and it did not really matter which way I went. I wanted variety, I did not want to follow a schedule. So I decided that I would head north, take it easier and spend some more time at each place I liked. 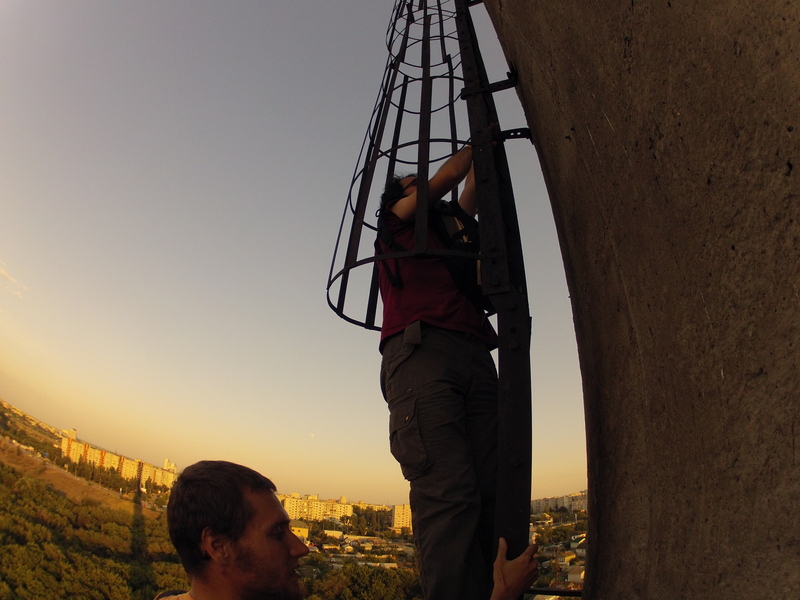 We headed down again, and I noticed that some of the screws that held the ladder against the chimney were missing. Nice… We made it back on the ground in one piece, and then Ivan and I bought a pizza and he took me to the center, where he and his wife had just opened a hostel, and we had dinner there with a couple from Astrakhan who were going on a hiking tour for a couple of weeks. The following morning I started my new route, destination: Moscow. It was about 1000km, so I had to split that in two. 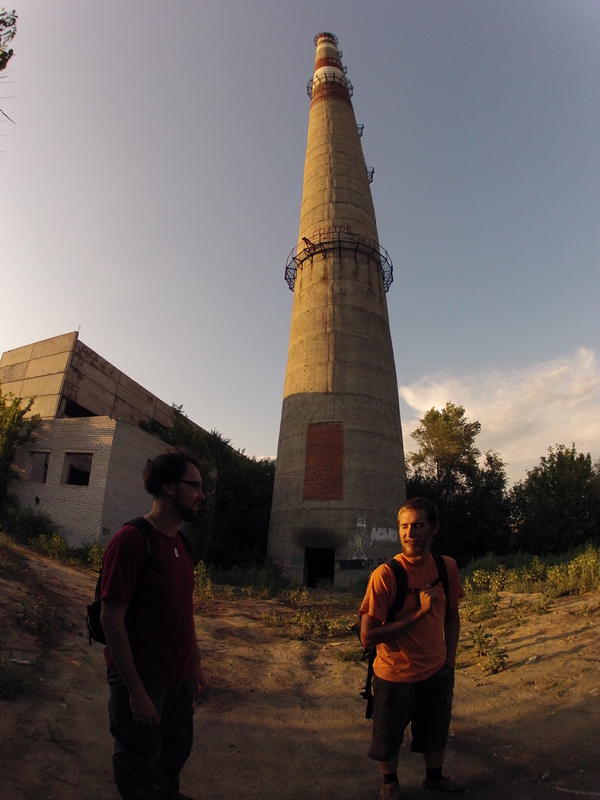 This entry was posted in Stroming The World 2013, Travel and tagged chimney, Volgograd by Kilian. Bookmark the permalink.